MEL asked writer Ryan Bradley to tour Los Angeles, imagining what we might lose after the Big One strikes. Read the entire series here. What remained after the Big One was the land, so it seemed worth thinking about the architecture that appeared, if not closest to it, most at peace with its difficulty. By all accounts the architect John Lautner did not like L.A.; he found it fake and plasticky, and retreated whenever he could to his family’s cabin north of Marquette, in Michigan’s Upper Peninsula. For three summers he’d helped build the cabin alongside his parents (his father, a professor of French and German; his mother, an artist), beginning when he was 12, hauling logs and fitting floors. The cabin was inspired by Norwegian folktales and named Midgaard — the land between ice and fire in Norse myth. I didn’t understand the power Lautner’s buildings had over me and all of L.A. until I understood this deep undercurrent of nostalgia, present in all his best work. He was longing for the sounds and space of home in a place almost entirely opposite Southern California, where water was abundant, trees and moss were deep green, and the land was gently sloping, glacially carved. Here, where the earth moved violently and the dry spells lasted months and even years, he built spaces for living that opened out to the world and created worlds within. I know, that sounds very woo-woo, but it’s hard not to drift into spacey speak when talking Lautner. The New York Times went there, calling his work “a seamless bond of nature, space and humankind” and so did he. “I have designed from within” he once said; he said he was grappling with truth, beauty, and infinite space. Infinite space in particular — he especially loved the endlessness of circles. Lautner apprenticed to Frank Lloyd Wright in the 1930s, and moved to L.A. in 1939 to work on Wright’s Sturges Residence, a concrete, steel, brick and redwood home built into and out of a hillside in Brentwood. Wright in the 1930s was turning ever more radical and modernist, and the Sturges home is a style Wright called “Usonian.” Usonia was a word Wright had begun to use for city and home planning. His aim was to free “American” or “New World” architecture from all the cultural baggage of history and focus on the land itself, as well as our footprint on it — our use, or usability, in Usonia. A Usonian home is small by today’s standards, about 1,200 square feet, and it relies on the sun for heat and the air to cool it and, as often as possible, a window for light. 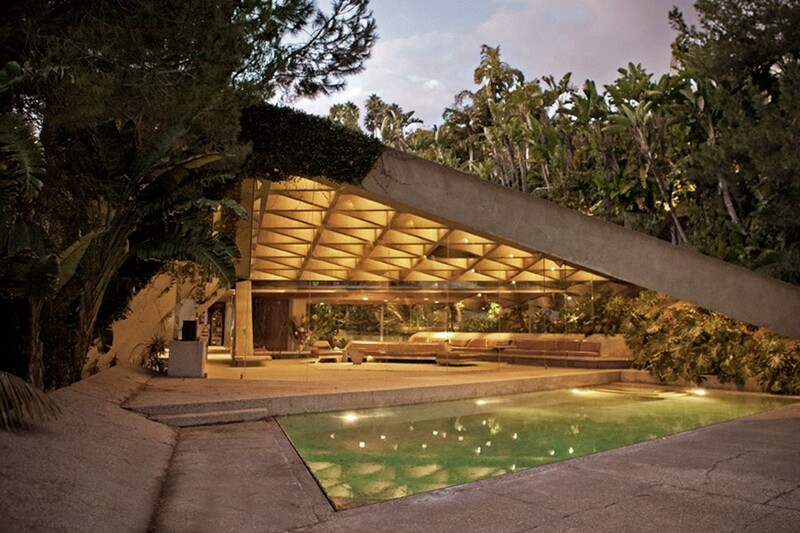 It doesn’t have a garage, but maybe an overhang signifying a carport, another word Wright coined. About a decade after Sturges, when Lautner was on his own, he completed the Sheats Apartments in nearby Westwood. They were his first of many circles, and an experiment in modern living, with artist studios on various levels and an old tree growing right up through the courtyard, practically into the top apartment, which quickly became known as the treehouse. Most everything else he did after Sheats was single-residence. His most famous, certainly the most iconic, is the Chemosphere: an octagon held up by a mast above a steep slope in the Hollywood Hills. You know this building, or the Sheats-Goldstein House, which he did a few years later in 1963, as residences for villains in films (Charlie’s Angels, The Big Lebowski). They are on the brink of kitschy but so well-designed, such interesting spaces from up close and far away, that the movies love them. What came before these homes, and what came after, is a fight Lautner was having with himself and this city, and his sense of creating places of community and privacy, of letting nature in or keeping people out, and of just what buildings in a place where the earth shakes can do, and who they are for. Future, sure, but that future is long past. One of the most charming aspects of Googie is how much the buildings bring the outdoors in. 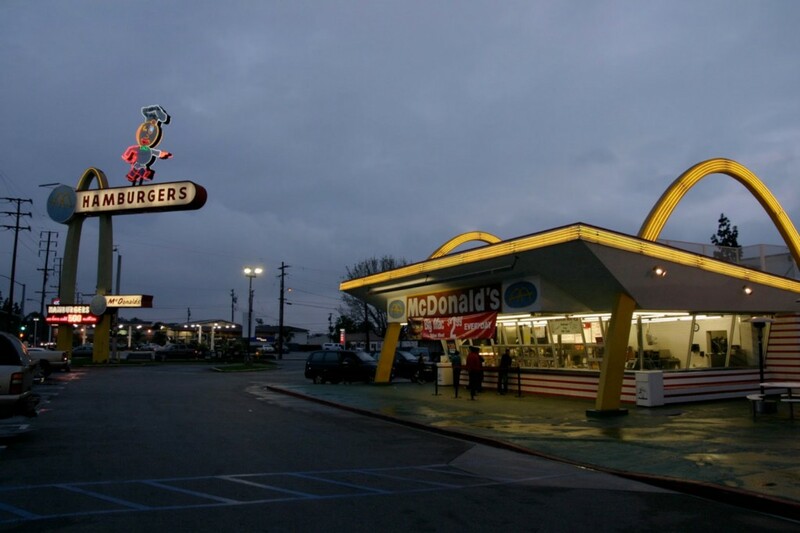 The last remaining Googie-style McDonald’s, in Downey, is all outdoors. 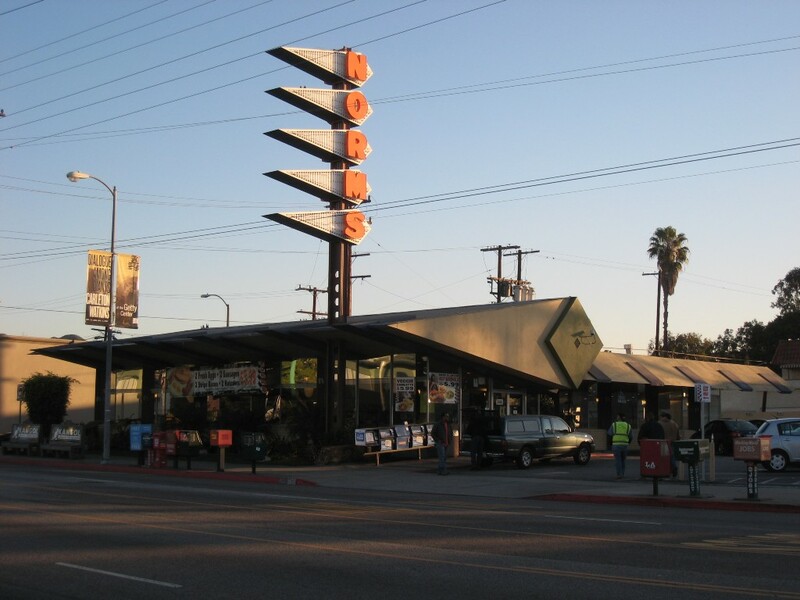 Norm’s and Pann’s, the great L.A. diners, feature large windows and walls made of stone. Most do. They are welcoming places, with long countertops and open kitchens and soft round booths near the corners of pitched roofs. They are loud, friendly places. It is a shame that Lautner didn’t make more, but in every Googie diner you can see his sensibilities, and Wright’s Usonian beliefs. 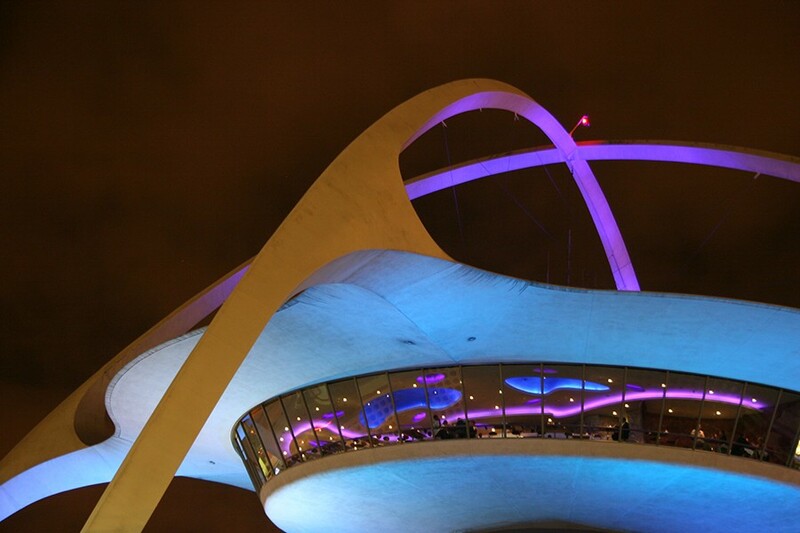 Left: Encounters Restaurant, LAX. Right: Norm’s Diner. In 1969 Lautner built a home that managed to merged all his conflict with LA’s land and culture, the outdoors inside, and inside out, the meeting of private and public life into one brilliant wooden box. The Walstrom House looked almost simple from the outside: Approaching it from the top of the hill through an oak woodland, you see the roof’s single pitch meeting the sides of the house and forming an isosceles triangle of wood slats, calling to mind the floor of a cabin. Midgaard, maybe. But then off the triangle were walls of windows, broken up by narrow wooden beams. As you walked down towards the front door the house opened up, you could see into nearly all three stories, including the central space with kitchen, dining room, living room, and deck all together. There’s so much wood at sharp warm angles it felt like a child’s puzzle. There was so much playfulness, so much light. Stairs from the living room led to a sort of perch that looked out over the home and out into the sunny canyon beyond, a bird’s nest in the oak canopy. 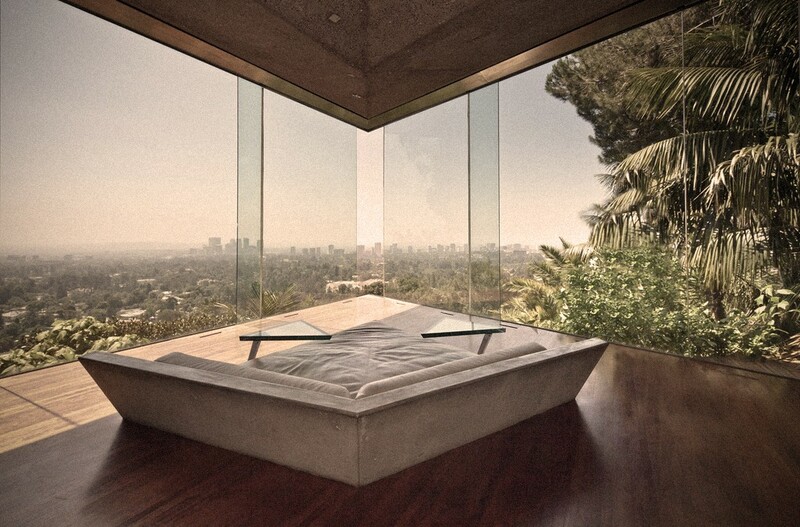 You could sit in it, inside, outside, overlooking the living space, overlooking the canyon. Depending on the day or the season or the marine layer, it might be warmer or cooler inside or out, fire and ice. In the nest, you were in that place between. Many years ago, after I received a scary diagnosis off a suspect mole, I traveled alone to New Mexico and wandered into the ruins of old cliff dwellings near Los Alamos. There, a ranger or docent or some person who seemed to know what they were talking about told me that the word “ruin” wasn’t quite right for what this was, because the dwellings often fell apart and were reconstructed constantly, over the course of a lifetime, then many lifetimes, then centuries, and on and on. The notion of a home as a place of some permanence was our belief, not theirs, the people who had lived here long ago. They had lived here, because this was a good place to live, sometimes, but they hadn’t lived in these rooms, these crumbling structures, she said. The rooms could only be living, you see, when people were in them.